Immerse yourself in the fun and thrills of shooting games. This is a very popular genre when it comes to gamers. It is no surprise that retro shooting arcade machines are still a hit today. These are where this genre first started and they continue to provide entertainment and challenges to beginners and advanced gamers alike. 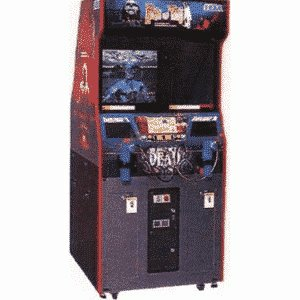 Of course, at Arcade Direct, we have a range of fantastic shooting arcade machines for you to enjoy. You can choose from some classics and big names that everyone will recognise. Whether you are hiring them for a party or a special event, they are sure to be a hit! Check out the range of different shooting games from Zombies to Retro! For all those horror and zombies fans out there, there is only going to be one shooting game that catches your eye and that is the House of the Dead. This is a fantastic game where you can fight the zombies and save the day. It was first released in 1997 so it is a classic with a lot of life left in it. It has been a big hit ever since its release and horror gamers still love this one today. You can pick up one of the guns, which are easy to use and aim them at the screen to defeat the enemy. Just watch out for the hostages along the way. Of course, one of the things that make this game so popular is the fact that it is a two-player game. There are two guns, which means you can team up with a friend and play together. You can play in the same scenario and see if you can defeat the zombies together. With the violent nature of this game, it may be best for adult-only parties and events. What are you waiting for? If you are looking for a shooting game that kids can enjoy at a party or event, check out the Point Blank arcade machine. This is different from a lot of other shooting games since it is non-violent and the only types of objects you can shoot include balls, apples and cars. This means this game is more about fun and testing your aim; it is less about horror and violence. 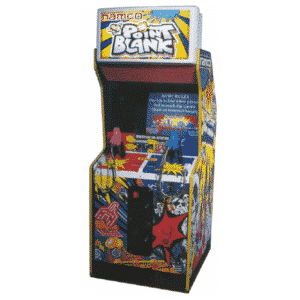 Point Blank is a retro shooting game that was created in 1994 by Namco. It definitely lives up to its reputation and there are over 50 competitions to keep guests amused. Everyone loves to pick up the guns and take aim. They are easy to use and two players can play alongside each other. There are different levels you can choose from to suit your skills. You also have several lives, so be sure to use them wisely! 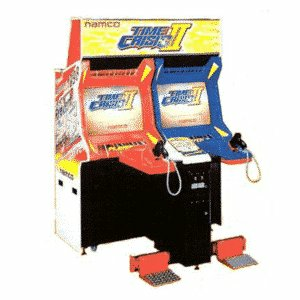 Following on from its predecessor is the Time Crisis II Twin arcade machine. This is an amazing game that is going to keep guests entertained for hours. This game first entered onto the screen in 1998 and it has been huge since then. It was created by big gaming name; Namco and it is an exciting shooting game that you do not want to miss. Not only does it enjoy brightly coloured artwork, but the plot is fun and fast-paced for everyone to enjoy. A unique feature about this arcade machine is the foot pedal system that was also used in the previous Time Crisis game. This allows players to shoot at the enemy and hide from fire. So, when you hit the pedal, your player will hide and be safe from bullets. It also gives you the chance to reload your weapon. You will have several lives in the game and once you use the last one, the game will end. This is the first Time Crisis arcade game to introduce two-player mode. This means that you can grab your friends and family and play alongside them. There is a gun for each of you, as well as a foot pedal. Importantly, you can work together and cover each other in the scenarios. It does not matter whether you are throwing a birthday party and looking for a fun game or are arranging an event and need entertainment, this arcade machine is going to be the highlight of the night. Are there any shooting games that you want to play? All of these classic arcade machines are available for hire today. They are originals that have been refurbished back to their ideal condition and bringing these popular retro games back to life. You can hire them for any occasion, which is a great way to provide entertainment and something exciting for your guests. In particular, adults and children love to play shooting games to test their aim, accuracy and reactions. Plus, with lots of different levels to play, everyone can find a game to suit their skills and challenge them.